An Arkansas couple struck gold twice after winning $1 million and $50,000 jackpots, both of them during this past weekend. Stephen, 54, and Terri Weaver, 55, of Stuttgart, Ark., left on Friday for a weekend trip to a cabin near Greers Ferry Lake, over 100 miles away. On Saturday evening, they stopped at T-Ricks convenience store in the nearby city of Pangburn. Stephen bought five $1 Million Riches instant scratch-off tickets while his wife bought four. "We pick up a couple tickets on the weekend when we go to our cabin on the river," said Terri, an office manager with a water company. "It's a weekly thing. We just pick up a few here and a few there." Once they brought the tickets to the cabin, they realized one of Stephen's $20 tickets won the $1 million jackpot. "I almost had a heart attack," said Stephen, who owns a plumbing company. "I had to have an aspirin." While Stephen wanted to return home after learning of the win, Terri hoped to stay for the weekend. "He thought he should sleep with it under his pillow," Terri said. "He ended up locking it in the truck." On Sunday, they stopped at the convenience store again and bought six tickets "just for the heck of it, because it was fun," Terri explained. This time, Terri's Taxes Paid instant ticket for which she paid $10 was a $50,000 winner. "When she handed it to me, I fell back in my chair and almost went into cardiac arrest again," Stephen said of the second ticket. "We jumped around, hollered, and screamed. It's just not possible that it happened twice. The odds must be astronomical." After possible taxes withheld, the couple won $714,000 in total. The couple, who have been married for 35 years and have a son in Tulsa, Okla., said they will continue to work in their respective jobs and pay off some bills. "We're going to put it in a little, or big, nest egg," Stephen said. The owner of the convenience store gets 1 percent of the winnings. "He's pretty happy too," Stephen said. Prior to this weekend, the biggest lottery prizes the Weavers say they won were $2,500 a few months prior and $1,000 a few years ago. "We were just ecstatic to get that," Stephen said. "Now we're just blown away." The couple said they plan to continue buying lottery tickets occasionally. 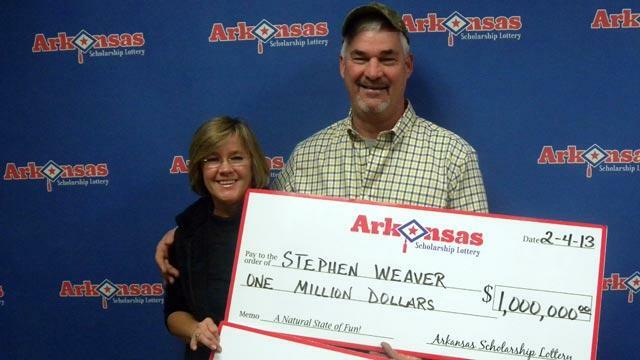 In fact, they bought a couple more lottery tickets at a gas station on Monday, when the couple claimed the cash prize from the Arkansas Scholarship Lottery claim center in Little Rock. "I got my money back," Terri said, when asked how much she won. "I didn't win anything big." Julie Baldridge, spokeswoman for Arkansas lottery, said there have been people who have won thousands of dollars twice, but none were jackpot winners. One man bought several tickets at the same time and won $20,000 twice. Another woman purchased a lottery ticket at a store and won $20,000. She later purchased a lottery ticket at another store and won $20,000 again. "Random can be a very odd thing," Baldridge said. Arkansas is the newest state to have a government-sponsored lottery. A little over three years old, the Arkansas lottery is one of 43 government-run lottery systems in the country.